Version 3 around the world! 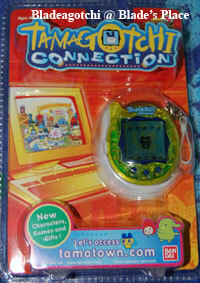 Tamagotchi Connection (note the new spelling) were released in Australia in February 2006. 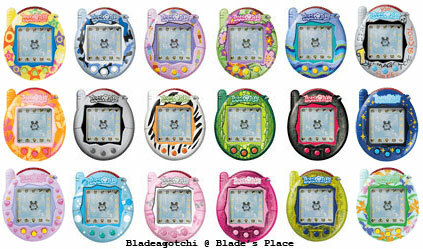 Version 3 Tamagotchi's have all the same features as the first two, but you can get codes for them, and loads more stuff, from the TamaTown website. Unfortunately, they do not interface directly with your computer. You use codes - from both the website and your tama itself. 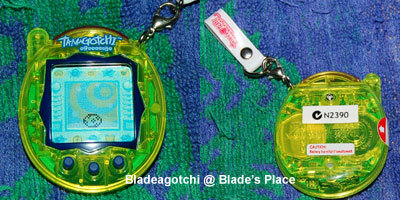 Pictured above is a GENUINE Version 3 Tamagotchi from Australia. 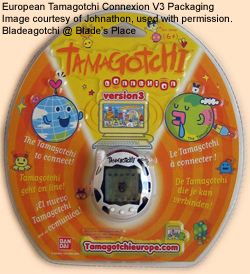 GENUINE Australian V3 Tamagotchi's will come in this style of packaging ONLY. Many Hong Kong sellers are passing off fake V3's in round bubble style packaging as coming from Australia! However, genuine ASIAN V3's DO come in round bubble style packaging, so be careful! I don't have pictures of all the Australian designs yet, and I probably won't ever. Some of the newer Genuine Australian V3's have a picture of a star on the sticker on the screen, instead of the usual character. This is perfectly normal and isn't a sign of a fake (some of the more clever fakes are aware of this too - the solution is never to purchase a Tamagotchi from a seller in Hong Kong, Macau or China). Also, this page shows some of the Asian designs. Are looking for V3 codes? Here are the standard ones that work on all V3's. Other codes are unique for your tam, and you get them from interacting with the TamaTown website. BCBC CABA = honey or love potion. You'll get a secret item - a costume - after you enter these 7 codes. To enter these codes, go to the shop screen and press the left button (button A) three times. When the shop keeper's face looks surprised, enter your codes. Button A is the left button, button B is the middle button, and button C is the right button. There is a better explanation on how these work on Kat's Mimitchi V3 section. Are you looking for the V3 instruction manual? You can download it here! Pictured here is a Version 3 Connection that was released in North America, and above it is a montage of the original V3 designs released there. 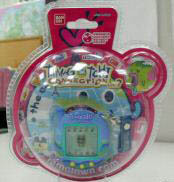 An American V3 will have Tamagotchi Connection written on the packaging, on the instruction manual and on the plastic keyring attachment. I'm sorry these are bad photos. I just can't keep up with all the latest releases of Tamagotchi outside of Australia. Pictured above are the designs of the European Tamagotchi Connection V3 release. You'll notice that some of them still have bead chains. If you spot and errors or have any corrections, please drop me a line.